Chyriell Drain-Hill ’83, M.S.E. ’90. It was 1983, and the Illinois State men’s basketball team was headed to Tampa as a No. 6 seed for a first-round NCAA Tournament matchup against Ohio. All of Redbird Nation made the trek to Florida, but one cheerleader was missing. Chyriell Drain-Hill ’83, M.S.E. ’90 was getting her bachelor’s degree in special education and was in the middle of clinicals at Parkside school in Normal. The Redbird cheerleader’s adviser was a big Athletics booster and told her she could go on the NCAA trip anyway, but she decided to skip the fun, stay home, and work. Drain-Hill continues pursuing her passion for education today, as director of school counseling for Belleville Township High School East in southern Illinois, just outside St. Louis. She has also maintained close ties to Illinois State since graduating, through the Black Colleagues Association and by helping with Homecoming. In March, she plans to join other St. Louis-area alumni at a private Illinois State reception, on the eve of the Missouri Valley Conference basketball tournament. Drain-Hill came to Illinois State because of the reputation of its special education program, spurred in part by a high school counselor who was part of a recruitment program that steered academically talented minority students toward Normal. The East St. Louis native worked with children who had developmental disabilities while in high school, and that left an impression. “Working with these students instilled my passion for education,” Drain-Hill said. A poster promoting Michael Jordan’s campus visit. She returned to Normal in 1984 for graduate school and went to work in the Office of Admissions & Records. 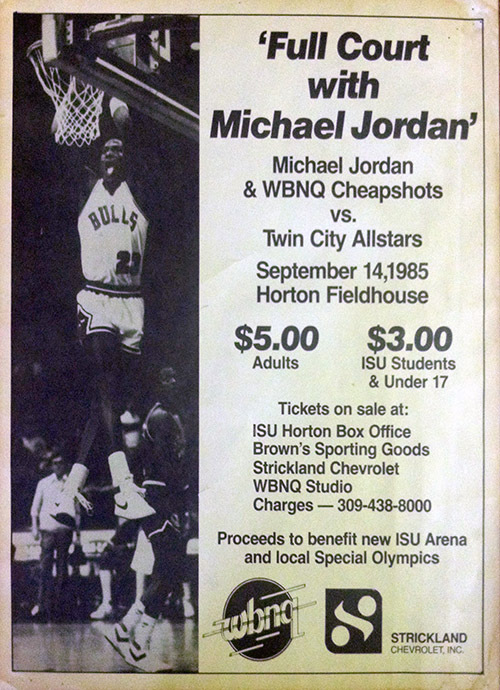 This ISU cheerleader had seen a lot of great basketball while an undergraduate student and that continued in 1985 when Michael Jordan came to campus for a charity game at Horton Field House, raising money for the new ISU arena (later Redbird Arena) and Special Olympics. As a staff member, the former student government and Black Student Union member advised the next generation of student organization leaders. She earned her master’s degree in school counseling in 1990, and she can rattle off a long list of professors that shaped her career and approach to education. Drain-Hill left Illinois State in 1991 and then taught special education in the St. Louis metro area, where three of her former cheerleading teammates also reside. She was hired at Belleville East in 2002, the same year she joined the Illinois ACT Executive Council, a group of professionals who advocate on behalf of their constituents who utilize ACT products and services. Now, she’s putting her school counseling degree to work. That job also keeps her connected to Illinois State because she’s helping high schoolers choose where to continue their education. She looks forward to sharing them with fellow alums at the private reception March 6 at City Museum. Update your contact information today for the latest, or RSVP right now.